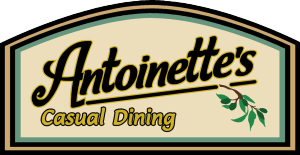 Don't let the cow fool you: Antoinette's is all about casual dining. Our menu exudes the rich flavors of Italian cuisine with appetizers like Parmesan artichoke dip, bruschetta, Caesar salad, Asian Chicken Wrap, Tuscan chicken sandwich, white margarita specialty pizza and build-your-own pasta entrees. Our menu also tempts you with our famous broasted chicken, spiral blue cheese chips, cranberry chicken salads, cashew with Asian chicken wrap, seven different classic burgers, a dozen specialty pizzas and many more tantalizing options. Antonio’s Sports Bar, located next to and connected to Antoinette’s, is the Plymouth's premier spot for catching the game, having a cold brew, grabbing a bite, or hearing some of the areas best bands and entertainment. Click here for more information. Looking for a place to host a party of 30-220 guests? Our onsite banquet hall, Amore, can accommodate your banquet and catering needs. Weddings, parties, company functions, seminars……Amore is your attainable & affordable answer. Click here for more information. Specials for the Week of April 15, 2019 Flatbread of The Week BBQ HAWIIAN -..